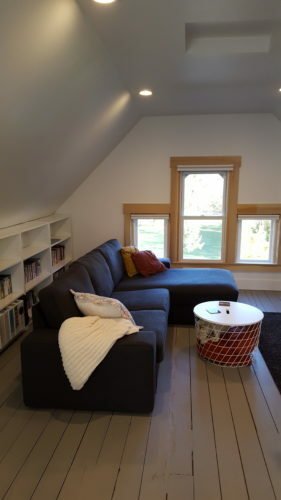 The Owner wanted to know if we could reinvent the attic in her 100+ year-old house as a place for her teenage children to hang out. She was using the attic as it was built: the place to store things that she rarely needed to access. She dreamed of having a space where her kids could hang out with their friends, where she could know who was visiting without giving them ongoing oversight. The attic had been remodeled in the late 1960s or early 1970s, with a wall framed in to make what may have been used as a bedroom. 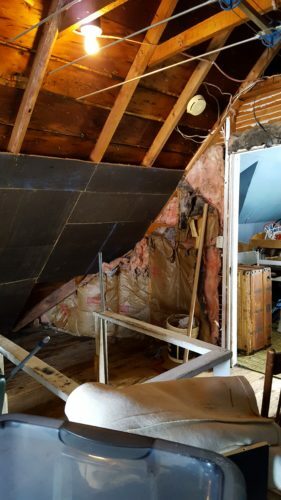 The remodeling was done in a make-shift fashion and the rest of the attic was essentially unfinished. The windows were single-pane and there was no insulation in the walls, offering no barrier against Minnesota’s bitter winters. But the attic had character, including wide-plank original floors and windows overlooking the side yard and a beautiful park across the street. 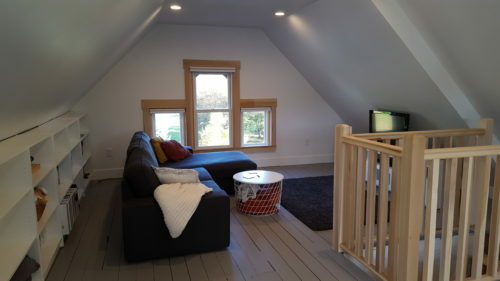 After walking through the attic, we envisioned a space that was much more wide open, with lots of natural light. Storage would still be available, but it would be contained to the kneewall closets and in storage furniture. The attic would be warm and cozy in the winter but cool in the summer, with year-round views of the outdoors. We knew it was important to have a space that could be used by the kids and their friends–so durable finishes and easily-arranged furniture were a must. As with any remodel in a century-old home, there were plenty of quirks and design challenges. For instance, the attic stairs were more of a ladder than a staircase. There was no room for a new stair, so we worked with the building official to make them as safe as possible. Finishing the ceilings required insulating to the current residential code–causing the ceiling heights to change considerably, and insulating/finishing tricky spots around the gables and kneewalls. We worked on-site with the contractor to find the best way to frame in these non-standard areas, creating effective and homeowner-friendly solutions in the process. An additional quirk: the heating and cooling system, which was too complex to extend to the attic. Instead, the solution was a mini-split system that serves just the attic. Heating/cooling can now be controlled independently of the rest of the house whenever the room is used, which is often. These challenges often lead to creative solutions and energy savings. It will be interesting to find out how much lower the overall heating costs are since the remodel. 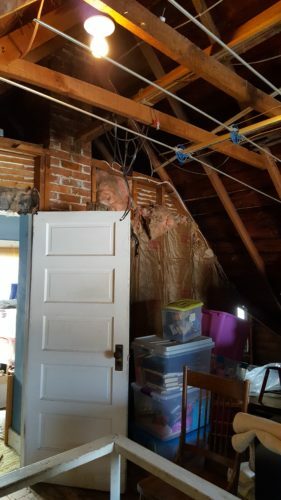 The original attic had no insulation, so any winter warmth seeped out the top floor. 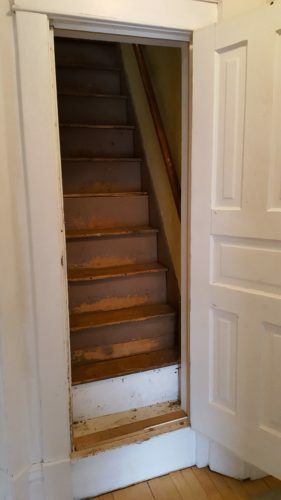 Now, insulation holds heat inside, and the door at the bottom of the staircase can be closed when the room is not in use. An important consideration in this project was allergens. One child has severe allergies, so it was critical that we found finishes–and insulation!–that would not trigger a reaction. Instead of carpet or an engineered flooring, the family took it upon themselves to reuse the original floor. After lots of vacuuming out the cracks between floorboards, countersinking nails, and general cleaning, the boards were painted a nice clean neutral grey. The floor adds immense character to the space and allows light to flow in and bounce around, and saved on material and installation costs for new surface coverings. Another clever solution was to carve additional storage out from behind the bookcases. The shelves aren’t mounted to the wall, so sentimental but rarely-accessed things can be stored safely and out of the way. In the end, the family found a lot of flexible, comfortable square footage–without putting on an addition. 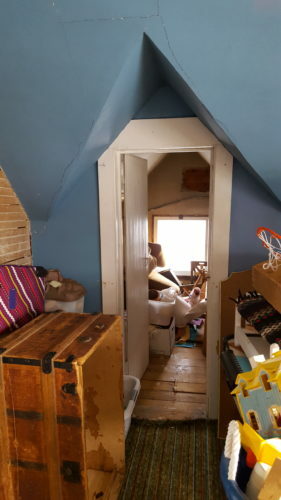 The kids love having a hang-out spot to share with their friends, but when they are gone, Mom sneaks up to the attic and has the whole room to herself. For her it is a getaway. Instead of cramped, chaotic, and cluttered, this attic now feels serene and relaxed: the perfect place to unwind after a busy day. 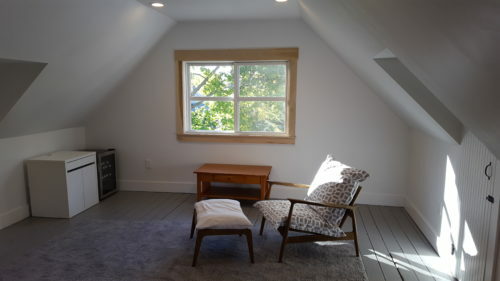 If you have an attic, basement, or bonus room that could become family room and want to make sure you get the most out of your space, contact us to schedule an initial design consultation.